Arroz Con Pollo meaning 'rice with Chicken' in Spanish is a traditional dish of Spain and Latin America. It might have some sort of Indian influence as the dish tastes a bit like "Indian Biriyani" in its simplest of form with less spices. The sweet fragrance created by chicken stock and a pinch of oregano gives it a unique essence. This dish can be made in variety of ways with peas, beef stock, wine combining to add an extra flavour, but without daring to make much experimentation lest the result doesnot suit our Bengali tastebud, I mostly stuck to the original recipe as explained by Elise Bauer, adding slightest of modification of my own and the outcome turned out really delicious winning at once the hearts of my family. * Please note the amount of chicken stock required depends on the quality of rice. 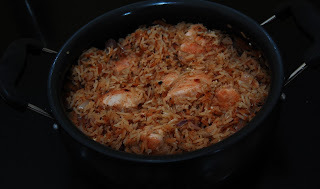 I used long grain Basmati rice which required 2 cups of chicken stock for preparing 1 cup of rice. Accordingly I have used 6 cups of stock for cooking 3 cups of rice. 2) Now add more olive oil to the pan and brown the rice. When the rice grains become slightly brown in color, add onions and ginger & garlic paste. 3) Stir fry the onions with rice till onions become translucent. In a separate bowl mix chicken stock with green chilli paste, tomato paste, salt and oregano. When onions turn soft, arrange the chicken pieces on top of the rice in a particular order and pour the chicken stock mixture over it. 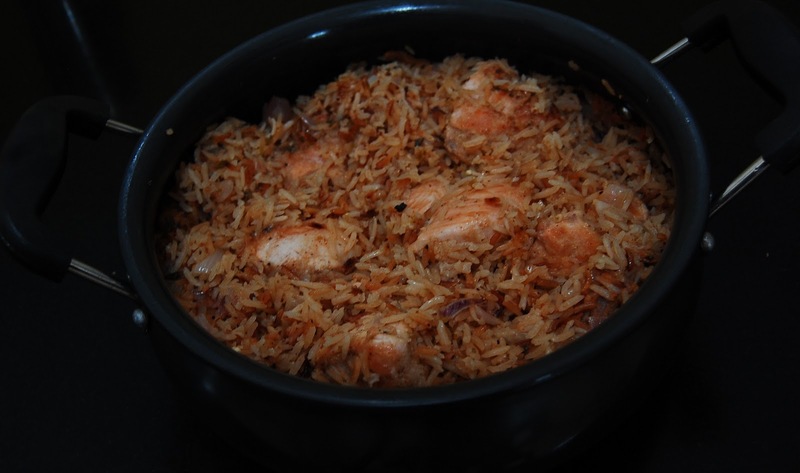 3) Reduce the heat to low, put the lid on and cook for 20-25 minutes till rice is thoroughly cooked. Serve hot.